We were in the Outer Banks, N.C. the second week of September. I had just reached the top of the steps to the dune deck and snapped the picture. Wow, don't the Outer Banks look good! I've never visited the Outer Banks but from the look of Andrea's photo maybe I should. Sunset photos always look good, but after a while it's easy to lose the excitement because, well, they all get to look the same. So what the photographer needs to do is somehow add something to the sunset to make a better picture. 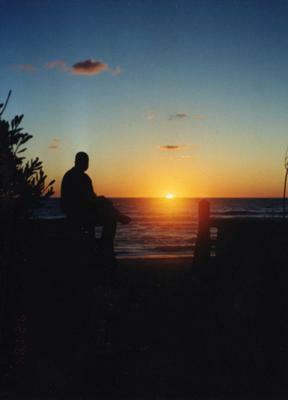 And here the silhouette of someone sitting on the left adds that extra something that a good sunset photo needs. By the way, I did a little searching for Outer Banks and it seems that the Wright Brothers were very busy there around the turn of the 19th Century. I've also found out that the area was hit hard by Hurricane Irene and I hope the area gets back on its feet from that really quickly. Thanks for the submission Andrea. By the way, do you own a digital SLR? 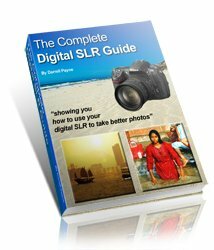 If so, take a look at my new Digital SLR Guide.